Please note, there are 2 x strips to each Crest Professional Effects treatment. For example 20 strips are 10 x treatments (10 x pouches). 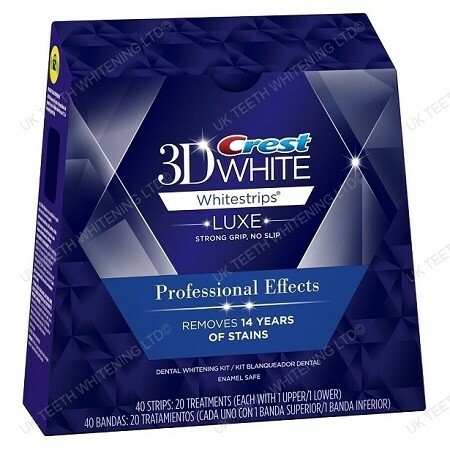 Crest Professional Effects 3D White Whitestrips whitens teeth like a professional-level treatment. Remove 14 years of stains in just 30 minutes a day. Advanced Seal Technology helps the strip to mold to the unique shape of your teeth and also come off cleanly and easily. Their no-slip grip means the strips stay put until you take them off, allowing you to talk and even drink water while whitening your teeth. You’ll see a whiter smile after 3 days, and full results in 20 days. Achieve professional-level teeth whitening results without the professional price tag. A: Because you shouldn’t settle for a smile that’s just “white enough.” Every Crest 3D White Whitestrips teeth whitening system guarantees a whiter smile. While Whitestrips and most whitening toothpastes remove surface-level stains, Crest Whitestrips remove set-in stains below the enamel surface for a visibly whiter smile. A: No! When used as directed, it’s a safe and effective addition to your beauty routine. Crest Whitestrips contain the same enamel-safe teeth whitening ingredient as dentists use to whiten teeth, therefore you can be confident that they’re safe. A: Crest 3D White Whitestrips are thin, flexible strips that are coated with a tooth whitening gel. Designed to conform to the shape of your teeth, they work by keeping the teeth whitening gel in place against your teeth to remove stains below the enamel surface. Whitestrips use the same, effective whitening ingredient dentists use.